St. George Island is a 22-mile barrier island with some of the most beautiful and serene beaches on the Gulf Coast. It is one of the last inhabited, yet unspoiled, barrier islands of Florida, with miles of uncrowded beaches for sunning and shelling, clear Gulf waters for swimming and excellent fishing, pristine marshes for wildlife viewing. Visitors can rent a quaint beach cottage, a multi-story luxury beach home, or lodge at one of the four Island hotels or inns. The Island is also very pet friendly. 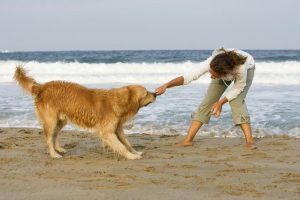 Well-behaved dogs are always welcome on our beaches and pets are allowed in many of the rental homes. 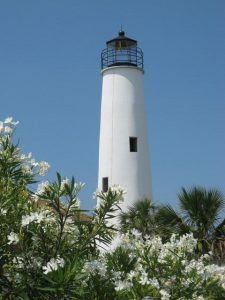 The newly erected 79 foot St George Island Lighthouse stands proudly in the center of the island. 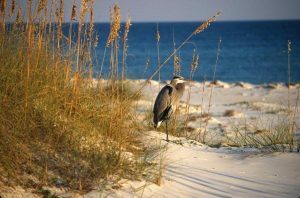 St. George Island State Park occupies the far eastern end of the island where you will find nine miles of pristine shoreline, majestic dunes, bay forest, sandy coves and salt marshes. The park has a series of hiking trails, boardwalks and observation platforms. Bird watching is a popular activity here. You might encounter one of the many migratory birds that use the island as a stopover on their way south or north. Sail or powerboats are available for rent, or rent a kayak and explore the remote bays and inlets where you might catch a glimpse of a bald eagle over head or a dolphin swimming in the surf. Rent a bike and ride the paved bike trail or head down to the state park for off road trails. If you like to fish you'll be in heaven on St. George Island where even a novice fisherman can bring home a fanciful treat for the evening meal. If you’ve made up your mind that you are truly on vacation and cooking is not on the agenda, St. George has a variety of eateries that serve only the freshest local seafood. Enjoy oysters surfside or dine on the bay watching the sunset. After dark the Island nightclubs offer live music, billiards, darts and other games. If that is not your thing, just recline on the beach and watch the moonrise over the Gulf or take the kids and watch the sand crabs scramble from hole to hole. Take a break from the beach and visit the great shops on St. George Island that carry everything from beach gear, clothing, gifts and books to gourmet treats, original artwork and jewelry. As an additional treat, stop off for a refreshing fresh fruit smoothie, a cup of gourmet coffee or some ice cream.